It is definitely fall out here in Turkey Hollow. With the cabin edging up the mountain, it’s a good 5-10 degrees cooler than in town in the valley, and the trees are already coloring in full force. With the wind and bright blue sky, it’s hard to not be swept away by the beauty–that and the turkeys that keep gobbling around the hills, so loud, so gentle too. Although I’ve been lush lately, with my forays to Table 50 and Red Hen, drinks last night at Local Roots, I have been cooking a bit–and after forking over $45 today at market, I better be cooking more. That’s a lot of food money there. But it included protein–two happy, local rabbits–so that’s more understandable. I also picked up a passel of potatoes, sweet potatoes, butternut squashes, and two cute little pumpkins to put on the mantle. Autumn is my favorite season & I want to celebrate it as much as possible! One of the main ways I celebrate the seasons, of course, is through cooking. And what screams autumn more than an apple balsamic reduction? It’s like the orchard married the vinegar. And it’s so simple–perfect for a Thanksgiving gravy alternative, too–and works well with pretty much any mushroom/protein I can think of. Seitan steaks? Mmm that’d be good with it. Tofu? Yup. Portobellos? Even better! It’s just a cozy sauce that warms the palate, but it’s exciting at the same time. 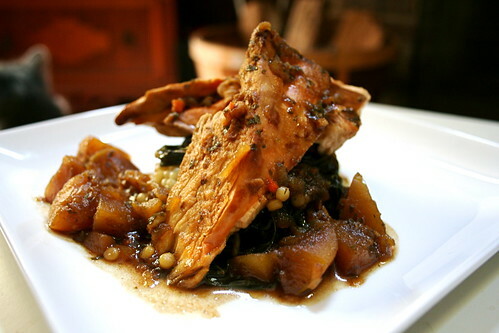 I served it over braised Chicken of the Woods Mushrooms with collards and an herbed Israeli cous cous–the perfect meal for a weeknight spent at home, cozied up with the cats and a fire. Cook garlic in a 1 tbsp olive oil in a saucepan over low heat for 1 minute, or until fragrant. Add the sherry wine, apple and balsamic vinegars, increase heat, and boil until reduced to half a cup, approx. 10 minutes. Add vegetable stock and boil until reduced to 1 1/3 cups, 20-30 minutes. Serve with mushrooms or a protein. Mmm, I could absolutely see this reduction drizzled over just about anything- When it comes to savory food, I’m a vinegar fiend! This does sound fabulous–and so easy to make. I need to try it on–anything, really. What’s the best mushroom? Chicken of the Woods! What a beautifully plated dish! YAY for Fall and apples and wild turkeys! That sounds great! I may have to try making that with some seitan or tempeh. Sounds great, I would like to try this on Butternut Squash Pasta! !, but …. when do you add the Granny Smith Apple ??? ?